The Committee Room continues its TCR Forgotten Pulitzer Series with His Family by Ernest Poole, winner of the first Pulitzer Prize in the best novel category. Published in 1917 and given the award in 1918, His Family tells the story of Roger Gale, an aging widower coping with life and trying to keep his family together in rapidly changing Manhattan of the early twentieth century. A New Hampshire Yankee who moved to New York as a young man in the Gilded Age, Roger -- the owner of a news clipping agency -- now finds his single-family, gaslit home surrounded by massive apartment buildings wired with electricity. Motor cars are replacing horse-drawn wagons. Most importantly, the city teems with Catholic and Jewish immigrants and their children. Roger comes to terms with the idea that these newcomers will soon dominate New York, a new kind of New York, and perhaps a better one. His Family was originally published by Macmillan. The dust jacket of the first edition, depicting the New York skyline dwarfing smaller older homes, was by E.C. Caswell, a leading illustrator. Larry James Gianakos, writing in PPrize.com says the His Family wrapper "may well have been Caswell's masterpiece...a work of great art in and of itself." Readers looking for a tightly plotted story won't find one in His Family. Instead, we leisurely and sometimes repetitively, follow the lives of Roger and his three adult daughters over the course of a few years. Eldest daughter Edith, a middle class matron with five children, resists change and clings to her haughty attitudes even after the death of her lawyer husband in an auto accident leaves her destitute. Second daughter Deborah, Roger's favorite (and author Poole's, too, it seems) is the hard-working principal of a tenement district public school. Pretty little sister Laura is a hedonist reveling in the loosened moral code of the new century. She likes a good time in the company of rich, handsome men and spends much of the novel away in Europe. With its often squabbling characters representing different lines of social thought His Family sometimes seems like a Progressive Era version of a Norman Lear television sitcom only without the comedy. However, Roger Gale, who remains at the center of the novel, is no Archie Bunker. He is calm, reasonable, and, some readers may find, insufficiently dramatic. Poole had several of his plays produced unsuccessfully on Broadway before writing His Family and he relies heavily on often stilted dialogue to tell his story. On the plus side, His Family honestly and thoughtfully addresses social and familial issues. Deborah's conflict in regard to whether she can combine a professional life with a husband and children reads remarkably like a contemporary "Can women have it all?" discussion. "There's no excuse for writing unless there some great message to give," Ernest Poole explained to Rose Feld of the New York Times in a 1924 interview. "Tolstoy preached in his books. Some of it, I confess, was quite bad, but nobody can gainsay that Tolstoy holds a unique position among the writers of the world. What is Les Miserables but a sermon in novel form? Yet nobody can accuse Hugo of being a dull old dog. Dickens was continually preaching against the poor laws of England, and Dickens has come down to this generation when the poor laws are no longer subjects of hectic discussion." Poole was born and brought up in Chicago, the son of a well to do businessman, but New York was the city that captured his creative imagination. After graduating from Princeton in 1902, he moved to a settlement house on the Lower East Side of Manhattan where he gained first hand knowledge of the lives of the poor and met the journalist Lincoln Steffens who advised him to always advocate a position in his writing. Soon Poole himself joined the ranks of leading muckraking journalists with articles on tuberculosis in the slums, labor strikes and other issues for Century, McClure's, and the socialist newspaper The Call. He also went overseas covering foreign affairs and his vivid reports from pre-revolutionary Russia for The Outlook are considered some of his best non-fiction writing. 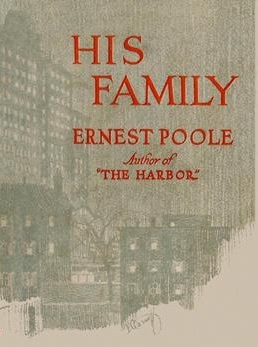 In 1915, Poole established himself as a successful novelist with The Harbor, the story of a romantic middle-class young man's introduction to the brutal conditions endured by workers along the often picturesque New York waterfront. Though His Family was received well by critics and the reading public, it was not considered quite as good nor was it quite as popular as The Harbor, which still stands as Poole's major work. It is widely believed that the Pulitzer Prize awarded to His Family was really a belated nod to the pre-Pulitzer The Harbor. In an article noting the reissue of The Harbor in 2012, Dennis Drabelle in the Washington Post wrote that Ernest Poole "may be destined to survive as a one-book man, but at least, with this reissue, we now have the right book." His Family was the eighth bestselling fiction book of 1917. The top seller that year was a holdover from the 1916 list, Mr. Britling Sees It Through, H.G. Wells' story of the wartime England home front. Bestseller lists are always full of now forgotten titles but the 1910s are an especially fallow period for popular works with any enduring reputation. Other books on the 1917 list include The Red Planet by William J. Locke (no. 2), about a disabled veteran of the Boer War returning to his English village, and The Light in the Clearing by Irving Bacheller (no. 3), a Dickensian tale of the rise of a young man from a humble beginnings. A curiosity on the list is Christine (no. 6) a lurid work of anti-German propaganda by Elizabeth Von Arnim (under the pen name Alice Cholmondeley) which presents a series of letters written by a young English girl studying music in Berlin just before the start of the war in 1914. The letters, addressed to the girl's mother, describe the supposedly coarse, drunken, and dangerously belligerent nature of the German people. Many readers and reviewers took the invented Christine and her letters to be authentic and the book is thought to have helped sway American opinion towards involvement in the war in Europe. Poole continued writing but never matched the success he reached with His Family and The Harbor. He persevered as a minor figure on the literary scene until his death in 1950. "Perhaps it’s the era. The time of Poole’s peak," speculates Rosecrans Baldwin in Fine Books & Collections as to why Poole hasn't been better remembered. "[Poole's time] was quickly eclipsed by those now considered the heavyweights of American literature: Fitzgerald, Hemingway, Faulkner, and on through the moderns...Next to His Family, Faulkner’s The Sound and the Fury, published only twelve years later, looks like some alien’s gift beamed down onto Earth, as though the next generation changed the game completely." Poole's later works include The Avalanche (1924), a novel about a young neurologist exploring psychotherapy that was an unsuccessful attempt by Poole to keep up with the times; The Bridge (1940), his autobiography; and Giants Gone: The Men Who Made Chicago (1943), a non-fiction work about the leading figures of early Chicago, some of whom Poole had known in his childhood. Keefer, T. F. Ernest Poole: Twayne's United States Authors Series, no. 110, 1966. Ernest Poole Collection (Princeton University Library). Ernest Poole Papers (University of Rochester Libraries). Following Pulitzer (Interesting blog on Pulitzer fiction winners). "The Novel Fox News Doesn't Want You to Read." John Stoehr. The Daily Beast. August 23, 2012.